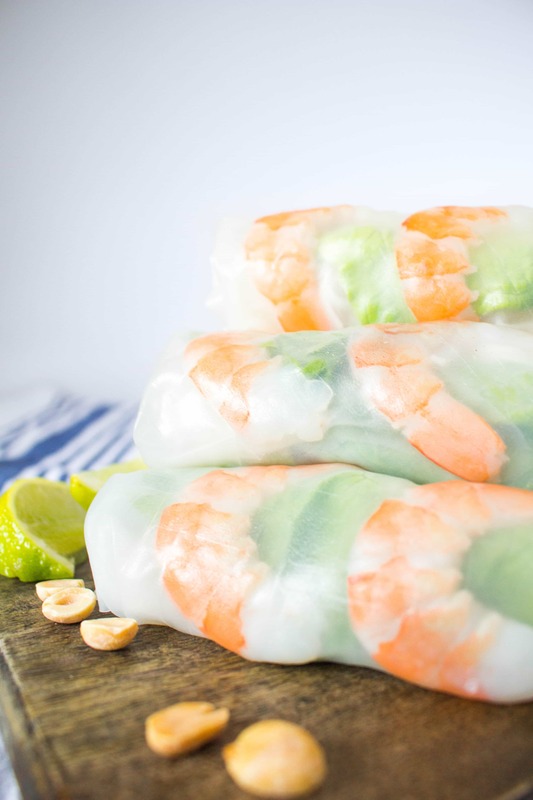 These fresh and healthy Vietnamese Rice Paper Shrimp Rolls are so easy to make! They’re accompanied by my go-to creamy peanut sauce. Bonus: other than boiling water, you don’t have to cook at all! This post is sponsored by OceanPrime. Growing up, my mother used to make these for me. Being the picky eater that I was, I always had the simplified version because I did not like bean sprouts, mint leaves, and any additional greens! As an adult, I’m still not a fan of bean sprouts soooooo if you’re looking for the super duper traditional version of these shrimp rolls then sorry, this is not it! The other day, I was absolutely craving these and like I mentioned earlier, I’m pretty picky so going to a Vietnamese restaurant for a roll means I’d be sitting there picking out the bean sprouts (since my partner likes it, there’s no point in ordering them without). One of the reasons I love this recipe is that other than boiling water, there isn’t any cooking involved. 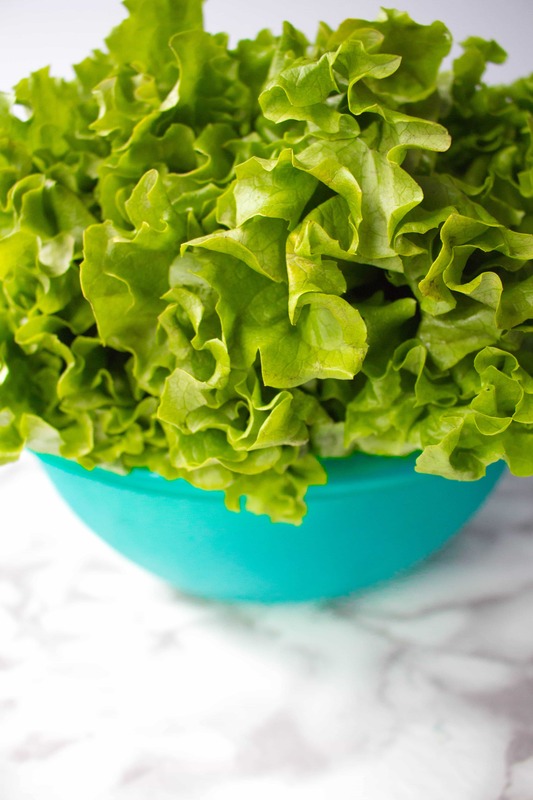 It’s a great way to get some greens in too without really thinking about it as it’s wrapped inside. 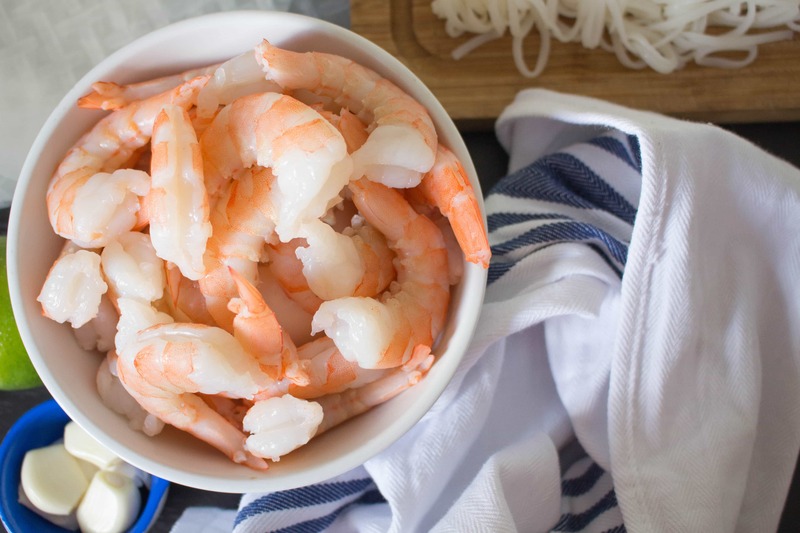 The shrimp is a great source of vitamin B12 and protein too. Healthy and easy! 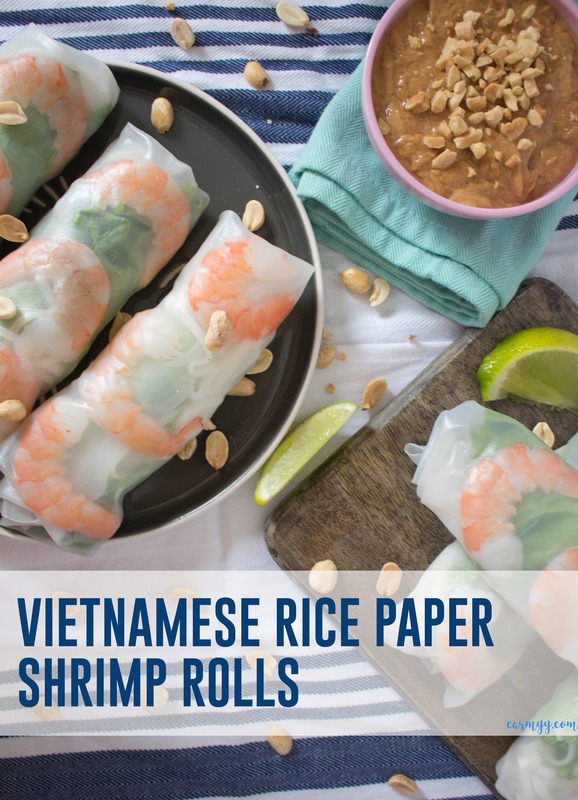 If you have a little dinner party, you can also set up “stations” and have your guest do a fun little DIY rice paper shrimp rolls! This recipe is super simple. Most of what you need is pictured up above. Curious about that butter? I ran out of olive oil (yes, can you believe it?!) so I melted some butter to keep the noodles from sticking together after they’ve been cooked. 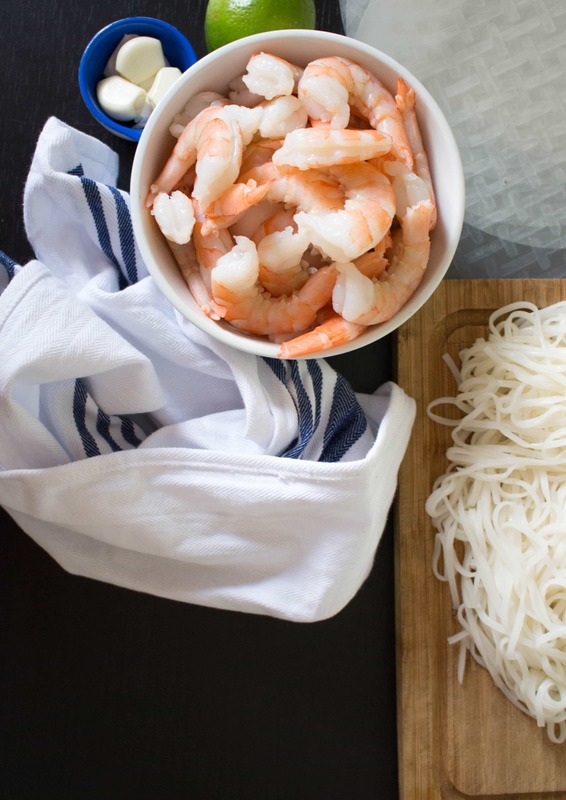 For this recipe, I used OceanPrime’s uncooked white shrimp. OceanPrime is Canadian company and they have been working with SeaChoice to ensure that their seafood is caught in a sustainable manner. Sustainable seafood are fish or shellfish caught or farmed in ways that consider the long-term viability of harvested populations. Overfishing in the fishing industry is a huge problem that even despite Canada’s strict regulations, we unfortunately take part in it. 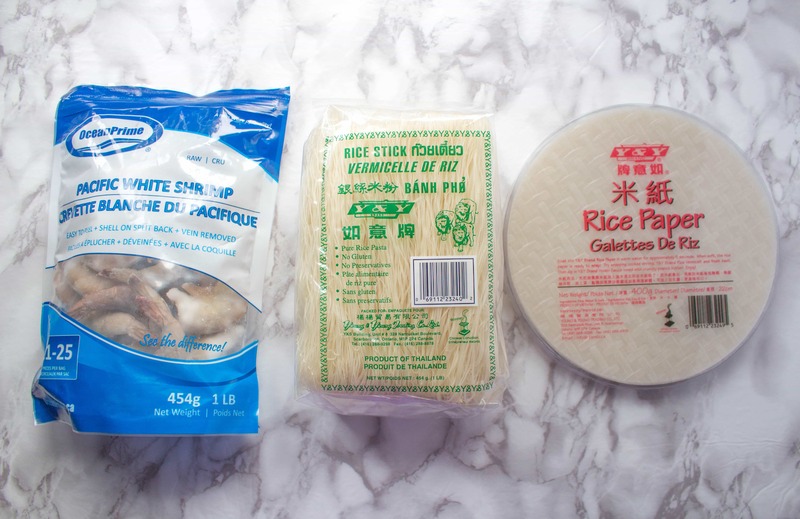 However, knowing that OceanPrime is not only Canadian but is high in quality while being caught in a sustainable manner makes them a trusted brand in my books and is something I’ll be keeping in mind while browsing seafood at the grocery store. The shrimp comes deveined with makes my life so much easier as I don’t have to waste time sitting in my kitchen with a toothpick, picking out the sand vein. A bonus is that with their deveining process, it makes peeling the shrimp a breeze as pictured above. Having the cut there from the deveining process is really helpful for this recipe too as you need to cut the shrimp in half. The pre-cut line there is a great guideline of where to cut! 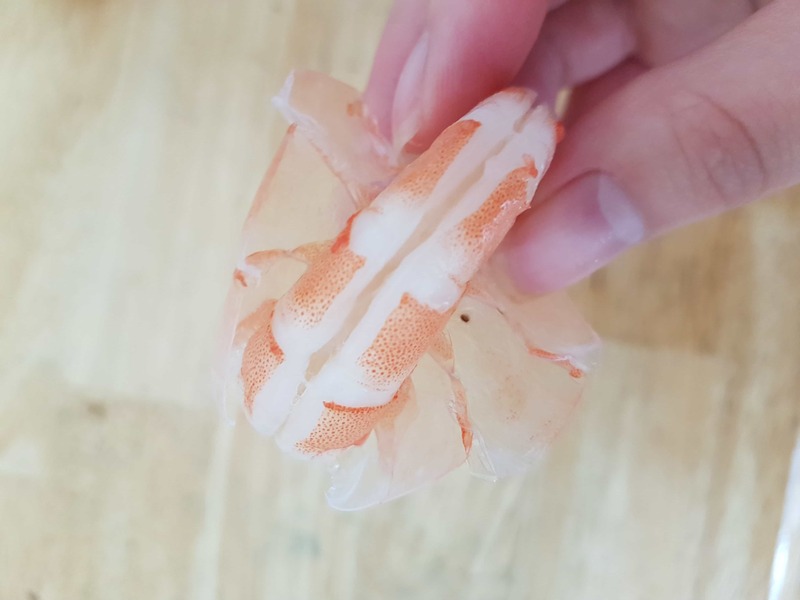 You can see below how the shrimp looks once cut in half. Below is a little step by step photo instructions to show you how I wrap my rolls. I find it easier to roll if the noodles are pre-rolled into the lettuce (step 3), this keeps everything in place! 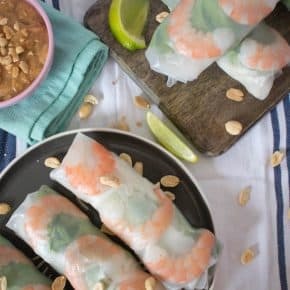 These fresh and healthy Vietnamese Rice Paper Shrimp Rolls are so easy to make! They're accompanied by my go-to creamy peanut sauce. 15 sheets of round rice paper 22cm/8.5"
Get a large bowl and fill with warm water. Place your rice paper into the water to soak until they're soft. 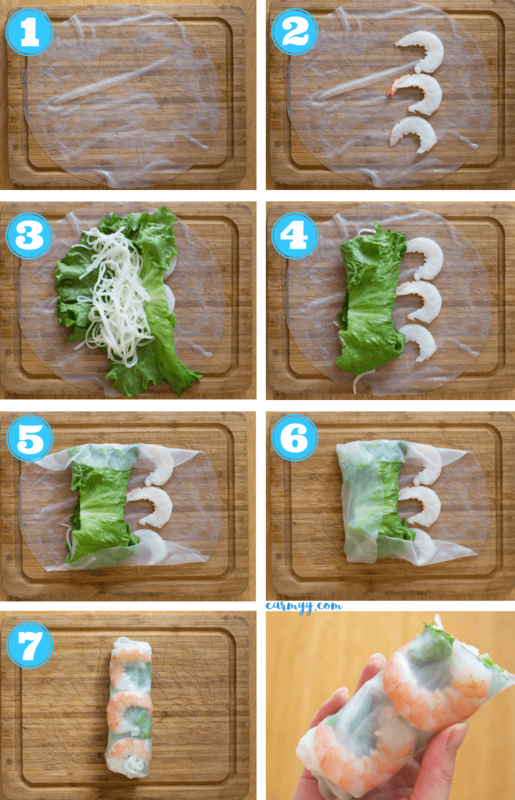 Place three shrimps, a leaf of lettuce, and your noodles onto your rice paper and roll them up as pictured above (sides first then roll in from the bottom). For the dipping sauce, start with 2 tbsp of water and add in all the peanut sauce ingredients. As you mix, add additional water until the consistency is just a bit thicker than ketchup. Tom would love these and they look so simple to make. I don’t like shrimp, so I might make mine with chicken, ha ha! This looks absolutely delicious. I love ordering them at Vietnamese restaurants and never thought about them myself. It looks so simple. This will make a wonderful summer meal. Omg these look sooo good. I love vietnamese cuisine, and these look great!!! Those look so yummy! I want them, please. Oh man you so totally nailed this! Your rolls are way prettier than how mine turn out!! I love making these for lunches to have all week. I need to try your version ASAP! These look yummy & easy. Love the pictures showing step by step. These look too pretty to eat! They must be delicious!! I love to make rice paper rolls and fill them with tons of yummy veggies! i love love love shrimp rolls but i have not made one at home. thank you for step by step demo. I love shrimp but have never had rice paper rolls. This looks like I need to try it! I love making rice paper rolls. Once you do it a few times, they aren’t as intimidating as they appear. I usually add a few slices of avocado to give them that creamy texture. Yum! I’ve used rice paper rolls once before and then I forgot about them. I remember them being so good! May just have to get myself some now.. These spring rolls are one of my favorite things to order out! Love them so much and always thought how easy they must be to make at home. Glad it is and I’m totally trying it! Recipes like this generally look complicated and scare me away, lol. But yours looks totally doable! Yum! I had no idea these were something even I could make! I always love them when we go out to eat! I always wanted to give rice paper rolls a try Carmy! I love this easy-to-follow tutorial!! I love to make rice paper veggie rolls with a yummy peanut sauce. These are fun to make and more fun to eat. Great for hot weather eating. You can create you own combinations….and these are great for a meal or appetizer. Party perfect for all the BBQ parties this summer. What gorgeous rolls! These would be such a fresh-tasting meal for summer. Thanks for the step-by-step photos. This makes it so much easier! I absolutely love Asian cuisine and these shrimp spring rolls look and sound fantastic and very healthy! That peanut dipping sauce has me drooling! I want to try this recipe very soon! I love the step by step instructions! It makes it so clear for me to send to my niece who is just learning to cook. Shes going to love this recipe, its exactly the kind of food she likes to eat! (ps… the photos of the brands you use is also helpful for her in her grocery shopping!). Always a classic recipe! I’m with you – I love the fact that there’s no real cooking involved in making these (unless you count boiling water). Glad to see that the company you’re working with has sustainability in mind. Shrimp is so good, but so environmentally problematic. It’s a relief to see more and more companies working with sustainability in mind! I’m with you on the bean sprouts. I’ll eat them, but I don’t love them so skipping them entirely is just fine with me. 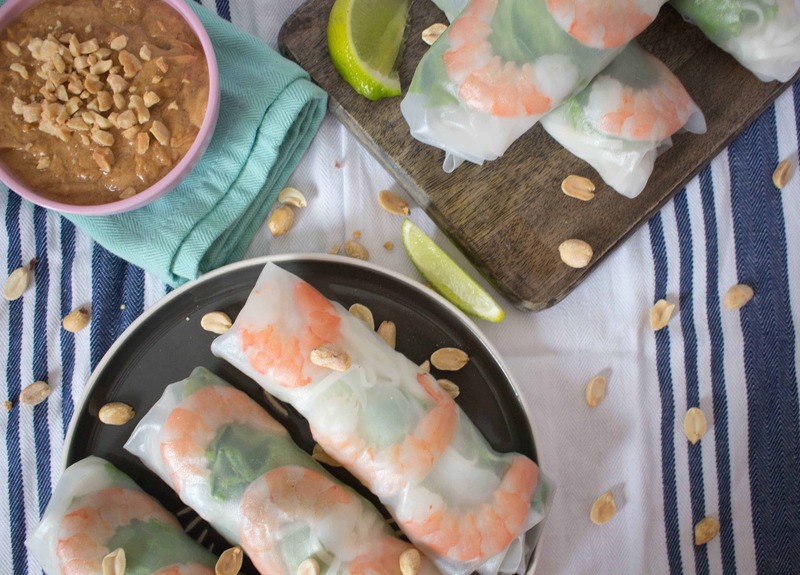 I adore the idea of creating a DIY Vietnamese Rice Paper Shrimp Rolls at a party. How fun! 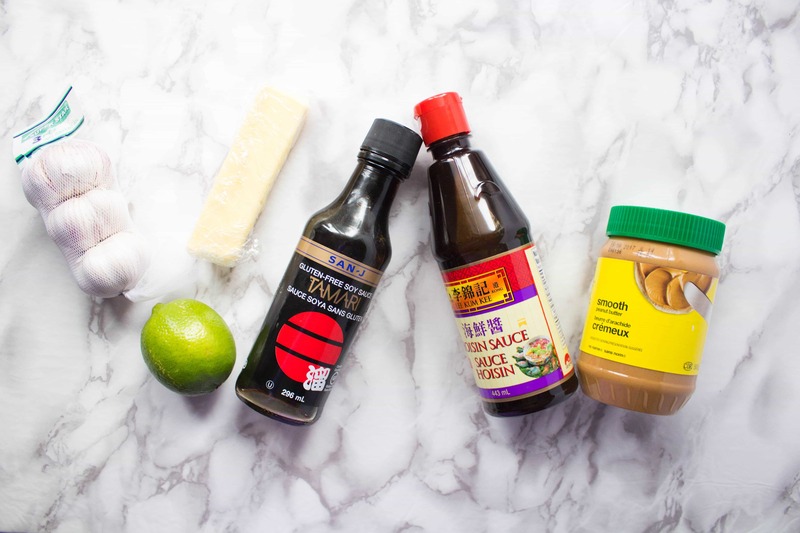 I can’t wait to make these — our whole family really enjoys Asian so I know these rolls would be a huge hit. We normally have a family fish fry in the summer so the rolls would fit right in. The problem is, I’d have to make quite a few. These are so beautiful and tasty! I love that there is really no cooking involved, which makes them perfect for a summer lunch! And I always enjoy eating shrimp!